Off to college? It can be a bit scary, especially if you don't know anyone at the school you plan to attend. Still, take heart; things could be worse. Girls and boys of the Okiek tribe of Kenya are ritually circumcised or excised when they're 14-16 years old. They then cover themselves in clay and charcoal and live in segregation for up to 24 weeks. Even the most extreme fraternity or sorority hazing in this country can't be that bad. Almost certainly. Among the things that might be worrying you about college, credit cards are probably pretty low down your list, if they appear at all. And yet how you handle your money over the next few years could have almost as big an impact on your future life as your SAT score. It could determine for years after graduation how easy you find it to rent an apartment, get a mortgage, finance a car or, possibly, even get a job, if a future employer consults your credit history as part of its background checks. 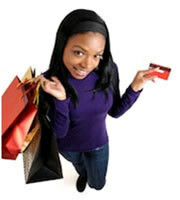 The student credit card you choose is likely to depend on your individual needs and lifestyle. So it's important to be realistic about how good a money manager you are. Do you take pride in your savings account balance? Are you someone your friends and siblings turn to for a loan when they're short of cash? Do you always have something put away for a rainy day? If so, you're likely to turn out to be a responsible credit card user. Congratulations! There's a good chance that you can earn valuable rewards and build a healthy credit score on the back of your plastic while you're at college. Are you one of those people who's always short of money? Do you often ask for advances on your allowance, and sometimes borrow from friends or relations? Does your savings account usually contain just a few cents? If so, you should almost certainly do yourself a favor, and avoid mainstream student credit cards. No matter how much you kid yourself that you're going to change your financial ways at college, in your heart of hearts you know you're not. But living without plastic could be tough, so what should you do? Well, how about a re-loadable prepaid card? Arguably, the star among these at the moment is the American Express Pass Card. Unlike many of its competitors, this one's very light on fees. In fact, you're likely to pay only for ATM withdrawals, which are charged at $2 each, with the first each month free. And it's easy for you or your parents to top your balance. Is all this worrying about school and money too much for you? Don't panic. You could always give up your college plans and apply to join the Okiek tribe. Kenya's beautiful this time of year. 0 Responses to "Starting college? Choosing the right student credit card is crucial"